Just in time to rescue me from my self-inflicted melodrama trauma come some old Filmindia magazines! 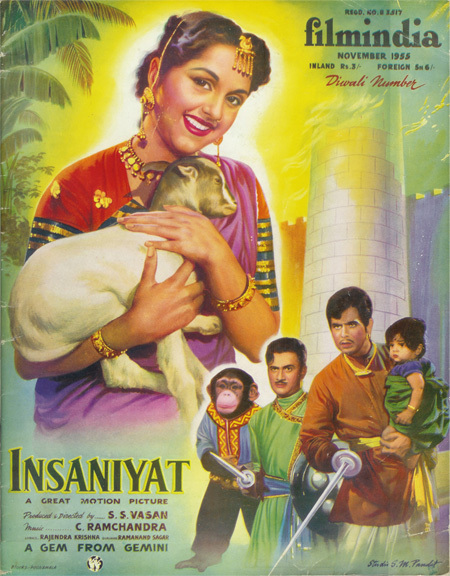 If you are unfamiliar with Filmindia, it was one of the first film magazines published in India (if not the first—inaugurated in the 1930s), written and edited by a hilariously acerbic gentleman by the name of Baburao Patel. His caustic wit and sharp tongue are legendary and he spared nobody—politicans and film people alike were all fair game for his particular brand of satirical sarcasm. 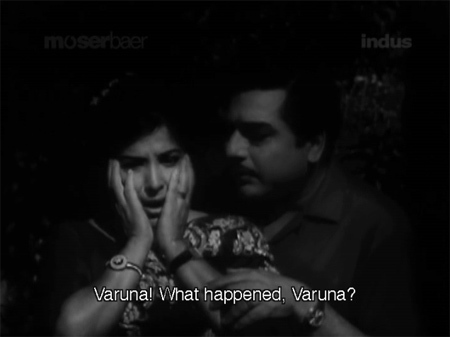 With all due respect to the film’s title, it is the mother and father of all Hindi family melodramas. A tangled epic of misplaced loyalties and self-sacrifice, it still has something which lifts it above regulation fare, at least for me. There is a slightly more complex plot—actually there is just a lot of plot; the film goes on forever (as does my post: you’ve been warned!). Also it doesn’t descend into the truly histrionic until about an hour or so in; up until then it’s an interesting story. It’s also blessed with some very good performances—Padmini as a proud street dancer and Ashok Kumar as a wealthy patriarch torn between his conscience and his pride are the standouts. The songs by Shankar Jaikishan are nice, and a Helen dance plus Pran’s usual slimy villainy don’t hurt either. This story would not even take up one handwritten purse-sized address book page, it is so lacking in substance. How then does it drag on for two hours! 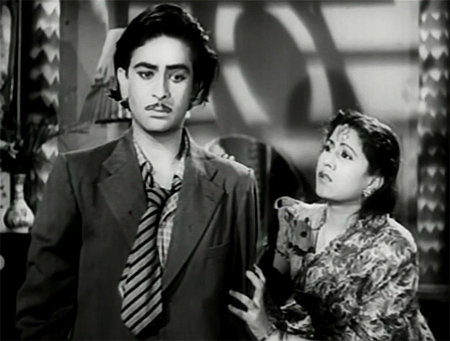 It was interesting for about the first half hour only because it stars a very young Raj Kapoor (he’s 23) and an even younger Madhubala (she’s 14!). 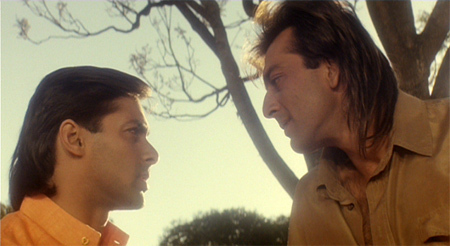 Seeing these two legends so early in their careers (plus the fact that Raj sings his songs himself, and looks a lot like the very young Shammi) made the time pass. After that, I kind of wanted to shoot myself. It’s essentially about two young and naive lovers who are surrounded by people who want to break them up, but aren’t clever enough to do so. Luckily for them, the lovers aren’t very bright either; there is a lot of ludicrously silly plotting which results in even sillier lover’s spats, leaving me at least with the wish that they would all just shut up and end the film, already. From the DVD cover: “the saga of an Indian woman…who helps her parents before marriage, and gives her all to her husband after marriage.” I should have run screaming, right? 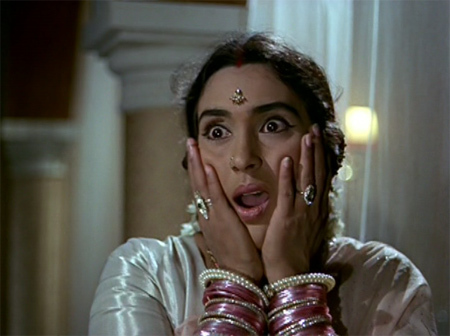 Especially since said Indian woman is also blind (and played by Nutan)? 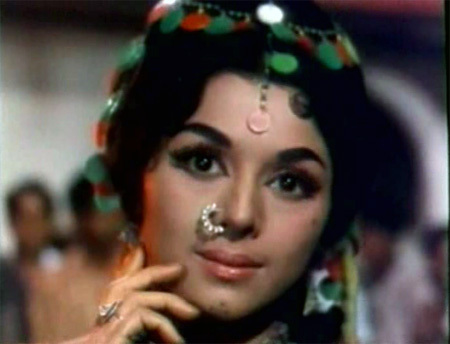 But Mumtaz, Laxmi Chhaya and the young Sanjeev Kumar are also in the cast so I decided to take a chance. Alas! it is every bit as bad as the DVD cover promised. I had to turn the whole thing into a drinking game: Greedy manipulative father figure lies to his “sons”? Drink! Blind woman weeps helplessly at her fate? Drink! Son sacrifices his own happiness (and that of his beloved) for no good reason? Drink! Blind woman gets sight back and devotes self to fake husband who spurns her? Drink! I’m not sure I would appreciate being called an “incubator bred chicken,” gorgeous or not! I struggle a bit with Hindi films that are a commentary on religion and atheism since of course by Hindi Film Law the protagonists all have to end up squarely on the side of religion. I grew up on a mission station, attended church every Sunday for the first 17 years of my life, sang in the church choir, belonged to the youth group, etc., until I left home and could finally choose what to do on Sunday mornings for myself (generally I chose to sleep in). So turning my back on organized religion and embracing atheism was an “informed” choice for me and I doubt that I will ever change my mind. Having said that, one of the things I appreciated about this movie was its open discussion of atheism and morality and how they are not necessarily in conflict. 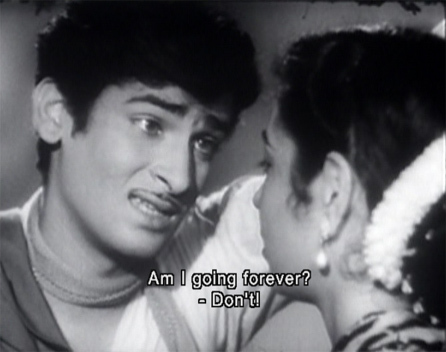 Plus: Shabana Azmi, Shashi Kapoor, Ashok Kumar and Bindu! But it’s good fun if you like light romantic fluff and can at least tolerate the cheesy excess.